Trawling is the use of the movement of the ship, dragging the fishing gear forward in the seabed or seawater, forcing the fishing gear to enter the net through the fishing objects such as fish, shrimps and crabs in the water, to achieve the purpose of fishing. When the fishing boat tows the net to advance, the stencil generates a spreading force under the action of the water flow, so that the net can be horizontally opened. During the operation, the fishing boat slowly advances and releases the net gear from the tail chute, connecting the stencil to the slab and disengaging it from the two stencil racks. Then the fishing boat moved forward quickly and gradually released two lines. After the trailer has been released for a predetermined length, the fishing boat is trawled at a predetermined towing and towing speed. The length of the drag is generally 3 to 5 times the depth of the water. The trawl speed is generally 3 to 5 nautical miles per hour. The net is taken once every 3 hours or so. When the net is lifted, the fishing boat slowly advances and picks up the skein. When the skein is spliced to the stencil, the stencil is fixed on the stencil frame to make it detach from the shovel, and the skein is continued to be taken from the tail chute. Drag onto the deck and remove the catch. To operate trawl nets successfully, there are four basic requirements a vessel needs to have: sufficient power to tow the net, a mechanism to hold the mouth of the net open, a system of wires to connect the net and the gear to the towing mechanism, and a mechanism for casting andhauling the net. 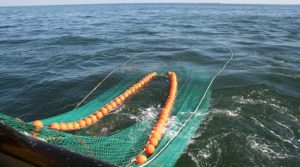 Depending on the size of the trawl net, it may be towed by a small vesselpowered by an outboard engine or a large freezer (factory) trawler (See Fishing Vessels –Trawlers). Also depending on size, trawl nets may be deployed and retrieved by hand or by using winches or other mechanized gear.